The Kissinger-Ford briefing, kept classified for thirty years and then redacted by the Ford presidential library until now, took place at 9 in the Washington morning, 4 in the Cyprus afternoon, on August 13. That was between the two waves of the Turkish invasion of Cyprus, known as Operation Attila. The first wave, Attila-1, involving 40,000 Turkish ground troops, air and naval forces, took place on July 20, 1974. The second wave, Attila-2, with another 40,000 invaders, commenced on August 14. That was fifteen hours after Kissinger and Ford had agreed to give the Turks their go-ahead; at the same time ordering the British not to defend Cyprus by engaging the Turkish attackers; Cyprus had been a British colony and by the 1960 treaty of guarantee Cyprus remained a protectorate of the British who kept two military bases on the island. For a brief account of Attila, read this. The outcome of the US-backed invasion was Turkish occupation of more than 36% of the island. For continuing US attempts to compel the Republic of Cyprus and the Greek Cypriots to capitulate and accept Turkish occupation under Turkish and NATO flags, and at the same time preserve the British bases on the island, read this archive of President Nikos Anastasiades’s negotiations with the Assistant Secretary of State Victoria Nuland. Left: Kremlin record of Henry Kissinger at the Kremlin with Vladimir Putin, February 3, 2016. They met again at the Kremlin on June 29, 2017. Right: President Erdogan last met Kissinger in New York, September 23, 2016. Read the document in full, including the hand-written notes on which the typescript of the conversation was based. Kissinger, then Secretary of State and Ford’s national security advisor, did most of the talking; General Brent Scowcroft, the deputy national security advisor, came in late, managing to squeeze in only nine words during the hour. 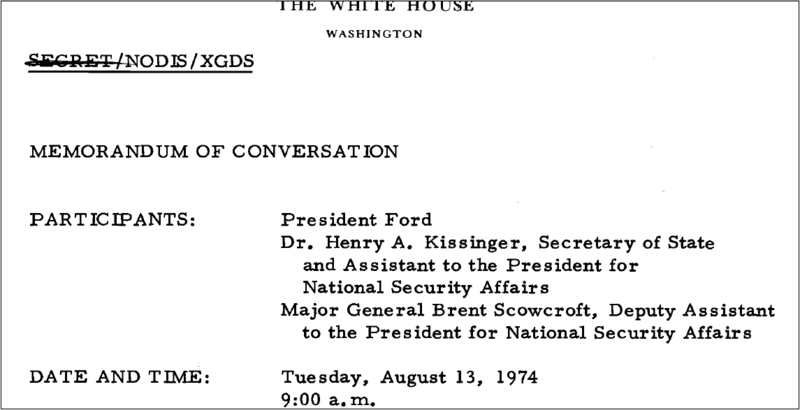 NODIS, the classification designation at top and bottom of every page, meant that the secrecy Kissinger intended for his discussion with Ford should be preserved by not distributing the document to any other US Government official. XGDS in the US Government’s classification manual meant the Kissinger-Ford document was exempt from the general declassification schedule. Secret forever, almost. The clock, Kissinger told Ford, should be allowed to run because it was running to the Turkish advantage. “Let’s wait a bit. If we come out of the Cyprus thing all rlght, we will have more leverage.” Kissinger already knew that Attila-2 was about to be launched, but he didn’t reveal that to Ford. On August 13, 1974, Ford had been president for just four days, following the forced resignation of Richard Nixon on August 9. Ford had also had no time to decide whether to separate the Secretary of State and National Security Advisor posts and promote another official to rival Kissinger’s power; in time Ford decided against doing that. On September 7, 2018, at the summit conference on Syria held in Tehran with the Iranian and Turkish presidents, Putin sought to keep the record of direct negotiations secret. The Iranians decided to broadcast the proceedings. Kremlin photo of the Tehran summit meeting, September 7, 2018. Note the Russian seating arrangements – the President was flanked by Foreign Minister Sergei Lavrov on his right; Defence Minister Sergei Shoigu on his left. Immediately behind Putin sat Dmitry Peskov. Officially the President’s spokesman, Peskov is a Turkish speaker and the most prominent pro-Turk in the Kremlin; Peskov’s daughter Elizabeth (Liza) is a lobbyist for Turkish clients; for details, read this. 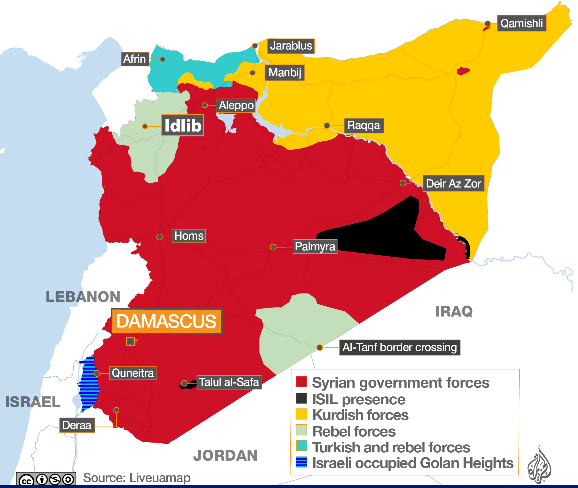 On September 3 Lavrov said delay in the Syrian operation could not be tolerated “indefinitely”. In Berlin on September 14 Lavrov said a great many things on Idlib, some of which have been interpreted as a Russian concession to delay the Syrian offensive in Idlib because of the threats of military retaliation by US and NATO forces. Lavrov tried explaining what the military implications of this “differentiation” mean to the Russian command. “It is necessary to understand what has been agreed in all cases of the creation of de-escalation zones. There the truce …doesn’t extend to terrorists. Oppositional groups are called to separate themselves from terrorists and to make contact with the government forces with our mediation, with the mediation of Turkey or Iran, and to agree [terms] for local reconciliation. Certainly, we will do everything that we are doing now, taking into full consideration the problems of the civilian population. 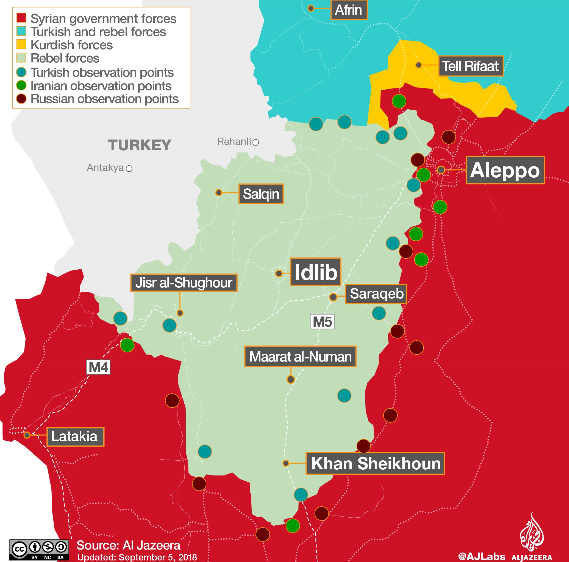 Besides, by efforts for the organization of local arrangements with these or those groups which are in the Idlib area, a humanitarian corridor [has been established] for those who wish to leave [the area] just as we did in the zones in the south — in the province of Homs and the creation of the East Guta zone”. In the old Kissinger formula it was accepted that Turkish territorial expansion by military means was in line with US strategy. For the moment Lavrov is leaving it to Putin to make clear with Erdogan if that’s still so – and if it is, whether Russia will do more about it than Kissinger expected at the UN.